Rosslyn Park recorded their first win in two months thanks to a narrow victory over Birmingham Moseley in Round 15 of National One. Park’s fourth triumph of the campaign has lifted them out of the drop zone and they are now one point clear of the relegation places at the midway point of the season. Defeats for Fylde, Old Albanian and Hull Ionians also aided Park’s cause, but there were wins for Caldy and Cambridge in the bottom half. At the right end of the table, Plymouth Albion, Ampthill and District & Old Elthamians all impressed at home while the top two clash between Darlington Mowden Park and Coventry was postponed. Plymouth Albion battled to victory over Old Albanian to move up to third place in National One. Fly-half Dan Mugford notched nine points while there were scores for Jamie Salter and Dan Pullinger as well as a penalty try. Jason Billows scored a well worked try on the hour mark for Old Albanian, but they were left with too much work to do as Albion secured the win at Brickfields. Hull Ionians slipped back into the bottom three of National One following a heavy defeat away at Ampthill and District. The A’s led 19-0 at the break thanks to tries from Peter Weightman, James Pritchard and Sam Hanks. After Hull Ionians’ Isaac Green and Maama Molitika exchanged tries, Hanks grabbed his second score of the afternoon. Sam Wilson dotted down just before the hour for the away side, but Sam Baker and Lawrence Rayner went over for the A’s to complete the rout. Wilson did cross again for the I’s, but it was another tough afternoon on the road for the Yorkshire outfit. Old Elthamians scored four tries to thrash Blackheath in front of a bumper crowd at College Meadow. Ollie Claxon (2) and Lewis Brown touched down as the hosts led 22-0 at the break in Mottingham. Dom Lespierre dived over to secure the bonus-point before Tom Stradwick scored a consolation try for Blackheath. Fly-half Dan Lewis kicked a superb late penalty as Cambridge triumphed in a pulsating local derby against Bishop’s Stortford. It was Lewis’ fifth penalty in a Cambridge performance that started well with Albert Portsmouth’s try. Stortford responded almost immediately when Matt Tomlinson went over and Seb Brownhill’s score late on, coupled together with three penalties from George Cullen, looked to had won it for Andy Long’s side. But Cambridge delivered a late hammer blow as Lewis smashed over a penalty from half way to clinch the win for the Blood and Sand. 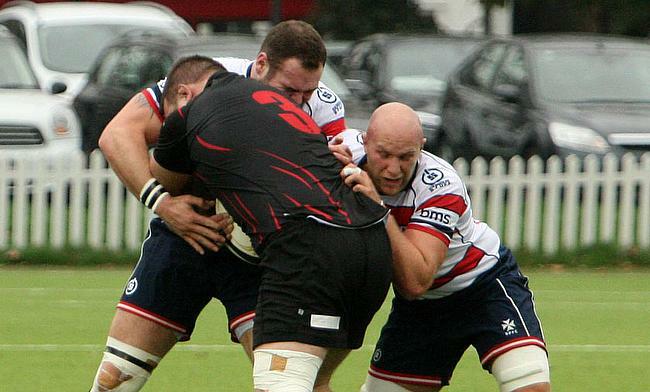 Rosslyn Park jumped out of the relegation places in National One as they managed to hold off a fightback from Birmingham Moseley to clinch their first victory since October. A try from Dan Barnes and two penalties gave Park a 13-12 lead with Birmingham Moseley crossing at the beginning and end of the first period. Blood pressure alert! @rosslynpark park won (hooray) but please don’t put me through that again. Well done. A penalty try and another three points pulled Park clear, but a third score of the afternoon kept Moseley in touch. However, the home side crossed again to lead by 11-points and despite a converted penalty try for Moseley late on, Kieran Power’s side held out for the welcome victory. Caldy earned a third win in five National One matches with a hard-fought victory over Esher. The Wirral side were looking to bounce back from their 29-17 defeat by Blackheath and managed to do so as their impressive home form continued. A try by from Nick Royle set them on their way and the converted score was the only points of the first half. The reliable Gavin Roberts went over after the break and slotted over a penalty to ensure the victory, while Matt Lowes’ try right at the death was merely a consolation for Esher. Loughborough Students produced a strong second half performance to return to winning ways as they eventually eased to victory over Fylde. The first period was a tight and cagey affair, but the deadlock was broken two minutes from the break as Will Kaye landed a penalty. Jarod Leat was yellow carded for Loughborough before the end of the half, but the Students stood firm in his absence. Kaye slotted over two more kicks after the interval before a score from Jack Stapley and a penalty try ended Fylde’s hopes as Loughborough powered to victory.